Let me acknowledge at the outset that my knowledge of radio control (RC) of trains, boats and planes is limited. This goes for battery operation as well. 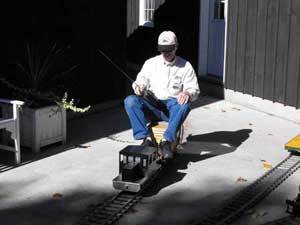 I believe radio control offers a lot of potential for garden railways and I want to learn more about it, especially now that I have moved to a house with a large backyard. Fortunately I was able to get a hands-on demonstration by two very knowledgeable garden railroaders. Brian Swanton and Clive Morgan in Lion's Head, Ontario, Canada have done extensive experimentation with operating garden railways in G-scale and 1" scale. The following notes are from a clinic they did on radio-control at a train meet I attended October 18, 2008 at their homes in Lion's Head, Ontario. 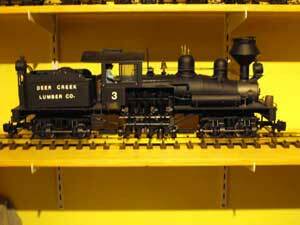 Photos of their layouts are available at Clive Morgan's garden railway and Brian's Kettle Valley Railway (KVR). Brian and Clive began experimenting with RC systems in 2007. It helps that Clive is an electrical engineer. The KVR's operating system is now totally RC. Here are some video clips of Clive's live steam locomotive and RC-controlled diesel. The following notes are from Clive's presentation on radio-control. His discussion was limited to 27 and 75MHz analog systems that are approved for use in controlling surface models (trains, vehicles, ships). The more expensive 2.4GHz radios developed for digital RCs are not covered due to their higher cost. A 2 channel AM radio is the simplest RC system for surface use with one channel dedicated to the throttle and the other to steering. Most of these radios come with two servos which are just small motors coupled to an actuating arm. The servo mimics the position of the joystick on the transmitter. As trains don't need to be steered only one servo can be used for speed control and the other can be used for something else. Clive notes that this system can be used for G gauge live steam locomotives with one servo operating the throttle and the other the reverser on the locomotive. Models using electric motors require an electronic speed controller (ESC). The output of the ESC is proportional to the position of the transmitter joystick. Push the joystick fully forward to maximize battery voltage in the forward direction. Reverse the joystick to output maximum reverse voltage. Because the joystick is spring-loaded, releasing it will return it to the center position and the ESC output will drop to zero. Clive points out that most ESC controllers are not suitable for model trains as their maximum voltages are too low (7.2 to 9.9 volts). Vantec manufactures a unit that is well suited to model trains. It is rated at 24 volts and 8 amps. (Vantec makes electronics for movie special effects).The advantages Clive has found for adapting a standard RC system for model trains instead of using a dedicated system (such as Aristo-Craft) are:Speed control is instantaneous. Delicate coupling and uncoupling of Kadee couplers can be done. Multiple channels can be used (bell and whistle, operate a coupler with a servo). Greater range: if you can see it you can control it. If the radio signal is lost the locomotive will stop. Can be used for passenger carrying miniature railways. (See the RC-controlled diesel on the page for Clive's railroad). Electrical noise from the motor has to be reduced. Two companies, RCS in Australia and Brian Jones in the UK, make ESCs that work with a standard surface radio and are directly applicable to model trains. Outputs from these ESCs are typically 18 volts and 3 amps. The principal operating difference is that the position of the joystick determines the acceleration and not velocity. Push the joystick forward to start a locomotive and when the speed is reached return it to the center position. Moving the joystick in reverse brings the locomotive to a stop. The transmitter can be turned off to save the batteries once the locomotive is moving. This can be useful on a simple loop, but is to be avoided on a complicated layout to avoid wrecks if you don't get it turned back on in time. In Clive's own words, "If I had to spend my money I would use a two channel surface radio with an RCS speed controller. The second channel can be used for sound. Since I don't have G gauge I just watch Brian's." Bachmann Consolidation with Aristo-Craft RC control (the first experiment). -LGB Mogul with a Vantec speed control and a Futaba transmitter/receiver. Bachmann ten-wheeler using an RCS EVO "B" series of ESCs with a Futaba RC radio. Scratchbuilt MOW unit built from the yellow diesel in the LGB starter kit using an RCS EVO "B" series of ESCs with a Futaba RC radio. A Shay (Deer Creek #3) with an RCS elite unit and an EVO "B2" installation. Brian and Clive made up a battery pack with 12 AA batteries providing 13.4 volts. You can see them in the photo of his Maintenance-of-Way (MOW) car. The 44-tonner Clive was building when I was there uses a speed controller from 4QD in the UK. It is rated at 12 volts and 30 amps. It regenerates to the battery when the locomotive is slowing down. The input signal is 0-5V from a variable resistor and a 5V signal for reverse. He uses a 2 channel 27MHz surface radio transmitter and receiver from Futaba. An interface unit was built to convert the pulse width output to the receiver to a signal acceptable for the speed controller. This unit optically isolates the receiver from the speed controller to avoid electrical noise interference. It also filters the radio signal to eliminate radio interference. I can attest that the locomotive will stop when the joystick is released. It was great fun to drive the train around Clive's yard. The 12 volt battery is hidden inside the seat on the trailing flat car. The locomotive is usually operated with the receiver antenna coiled reducing the range to 20 feet. As Clive says, "If the grandchildren drop the transmitter the train will stop. The system is practically fail safe,"
After four and a half years of experimentation with different operating systems I finally feel that I have the best system I can find for this layout. I can have it up and running in five minutes. My oldest grandson can set it up and run the whole system as well as Clive and I can and the other two boys can each run a train on the layout. I no longer need to be concerned about electrical track connections or clean rails. The best part is that I can have a large number of people operating trains on the layout at the same time once they become familiar with the RC system in their engine." Brian says he bought his Futaba through HobbyHobby and the RCS units from Northwest Remote Control Systems in Oregon. Happy railroading with your RC-controlled garden railway. I hope to build one too! Go from "radio-control" to my electronic speed control in HO scale. Return from "radio-control" to my Home Page.